What do you do with a ton of Anaheim Peppers growing in your back yard? 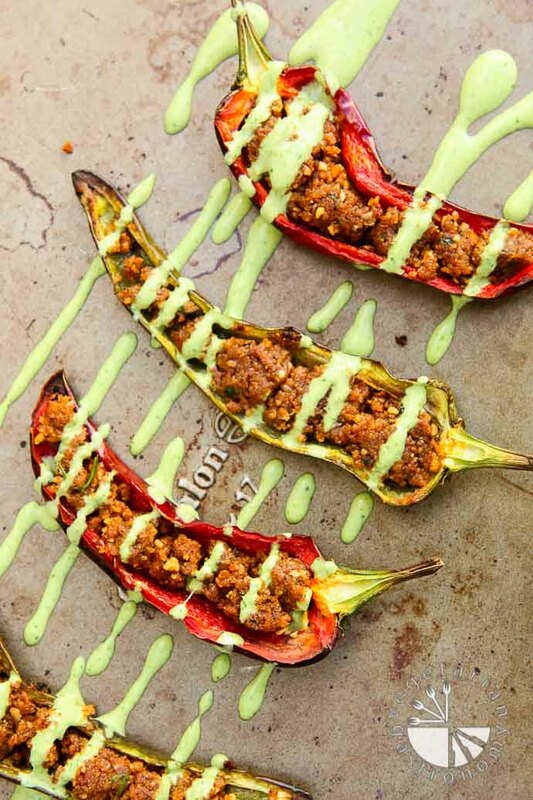 Stuff them of course… with my Savory Walnut Sun-Dried Tomato Crumble, and may as well drizzle some of my Creamy Cilantro Tahini Sauce on top while you’re at it. This combination was so quick and delicious that I had to share! These Savory Stuffed Anaheim Peppers are great to serve as a side or appetizer for a party. The savory stuffing, fresh peppers, and creamy cool dressing makes a great combo. It’s easy, healthy, and delicious! Simply prepare the walnut crumble and creamy cilantro sauce ahead of time, de-seed the peppers, stuff, bake, drizzle, and enjoy! You can even prep the Anaheim peppers and stuff them ahead of time and bake when you’re ready to serve. If you haven’t tried my Savory Walnut Sun-Dried Tomato Crumble yet, you MUST! I’ve been receiving great reviews of the recipe over on Instagram from followers and friends who have tried and loved it! It goes great on salads (my Ultimate Taco Salad Recipe), in tacos, in pastas, or even crumbled on-top of nachos. 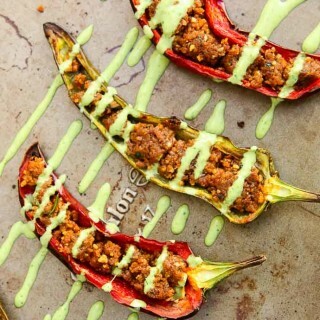 My mind is brewing with more ideas on how to use this awesome crumble as we speak, but for now, go make the crumble and try these stuffed peppers. And once you’re done, make my Ultimate Taco Salad with any leftover crumble and sauce! 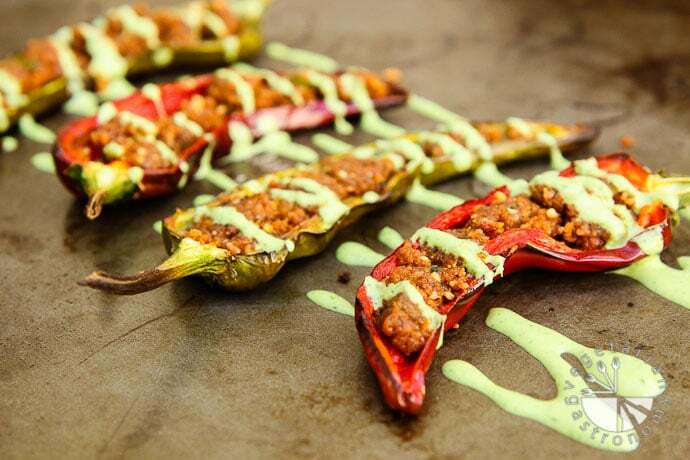 These stuffed peppers make the perfect flavor-packed bites! They're full of good-for-you ingredients and a huge crowd pleaser! Prep the Anaheim Peppers by cutting each in half lengthwise, keeping the stem at the end on. Remove the seeds and insides of each half to create a boat for stuffing. Stuff the prepared Savory Walnut Sun-Dried Tomato Crumble into each half. 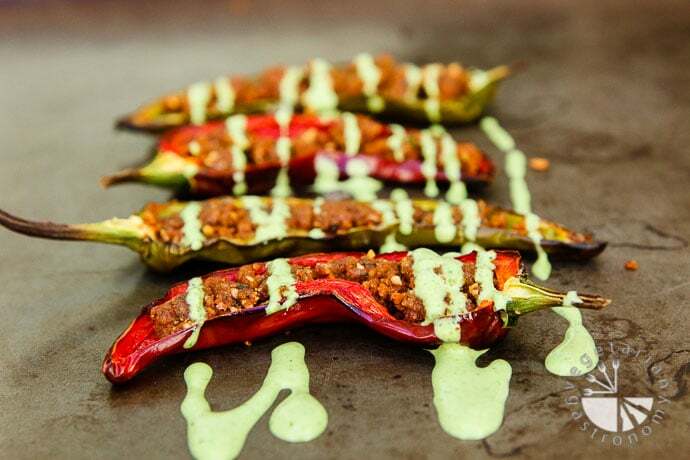 Line a baking sheet with parchment paper, or simply place the stuffed Anaheim Pepper halves directly on the baking sheet. Bake in the oven for 5-10 minutes until the Anaheim peppers seem cooked. Be sure not to let the top crumble brown too much otherwise they will get burned. Remove from the oven, drizzle with prepared cold Creamy Cilantro Tahini Sauce , and serve hot or cold! Use the leftover crumble and sauce to make my Ultimate Taco Salad recipe. These peppers can easily be prepared ahead of time, stored in the fridge, and simply baked prior to serving. Thanks Rashmi! It was perfect since I needed something to do with the gorgeous peppers from my yard! I love it when recipes are not only a one-time delicious meal, but teach me how to make stand-alone items that I know will become staples in my vegetarian repertoire. The savory walnut crumble in this dish is phenomenal, and the creamy cilantro tahini sauce is so versatile that I can't stop thinking of all the delicious things I can put it on. I stumbled upon this recipe because I was looking for something to do with the red Anaheim peppers I found at the farmer's market, and wound up discovering so much more! Thank you Anjali! Oh wow...such an awesome comment! Made my day =) Thank you so much for the great review, for trying it out, and stumbling upon my blog! The crumble is SO versatile...the taco salads is one of my favorites, along with a new recipe coming soon using the crumble! Thanks again so much for tagging me on IG, sharing the picture, and the kind words! Mind if I share your comment sometime on my IG/FB? What a great review...thank you Christine!! I'm so glad you loved it...and yes the crumble is such an awesome flavor-packed addition to anything and made with clean ingredients! Hope you tried it on the taco salad since it's one of my favorite recipes! Thank you for trying it out. Let me know if you need a few more great suggestions from my site if you are new to cooking less meaty meals! You can contact me on my page or just leave a comment anywhere. OMG! I never comment anywhere, but this is SO good I had to say thanks. Thanks! I can’t wait to check out your other recipes. So so great to hear!! So you made the crumble I'm assuming...that stuff is super addicting! Make my tofu black bean tacos with the crumble, or my ultimate taco salad with the cilantro dressing! The stuff is so good! Thanks so much for the great review!